Turkey has announced a series of measures in retaliation for a Dutch decision to block its ministers from campaigning for a referendum. Deputy PM Numan Kurtulmus said the Dutch ambassador would be barred from returning to Ankara, and high-level political discussions suspended. Turkish attempts to hold rallies in Germany, Austria, Switzerland and the Netherlands have been blocked. President Recep Tayyip Erdogan accused the Dutch and Germans of Nazism. 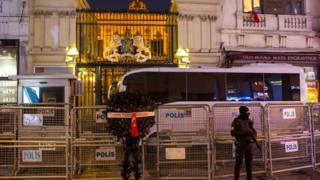 The BBC’s Mark Lowen, in Istanbul, says that Turkey and the Netherlands, two Nato allies, are now locked in an “unprecedented diplomatic crisis”. Meanwhile, German Chancellor Angela Merkel has offered the Netherlands her “full support and solidarity”. On Monday, the Dutch foreign ministry issued a new travel warning, urging its citizens in Turkey to take care and noting the new “diplomatic tensions”. The row comes just two days before a general election in the Netherlands dominated by concerns about immigration and Islamic radicalism. Dutch Prime Minister Mark Rutte cited security concerns ahead of the election as a reason for blocking the Turkish rallies. How did the row come about? The proposed rallies aimed to encourage a large number of Turks living in Europe to vote Yes in a referendum on 16 April on expanding the president’s powers. The plans were criticised by senior EU officials on Monday. In Germany, for example, there are more than three million people of Turkish origin, of whom an estimated 1.4 million are eligible to vote in Turkish elections. In effect, the diaspora is Turkey’s fourth-largest electoral district. Officials in Germany, Austria and the Netherlands said the rallies could stoke tensions. A gathering in France went ahead, however, after officials said it did not pose a threat. Two Turkish ministers were barred from addressing crowds in the Dutch city of Rotterdam, with one of them escorted to the German border. Police used dogs and water cannon against protesters waving Turkish flags in Rotterdam. What measures is Turkey proposing? He added that all high-level political discussions would be halted, and parliament would be advised to withdraw from a bilateral friendship group. The measures would remain in effect until the Netherlands took steps to “redress its actions”, the deputy prime minister added. Earlier Mr Erdogan likened the Netherlands to “a banana republic”, demanded international organisations impose sanctions on the Netherlands, and accused countries in the West of “Islamophobia”. “I have said that I had thought that Nazism was over, but I was wrong,” he said. Turkish officials have also suggested reconsidering part of a deal with the EU aimed at curbing an influx of migrants, namely Turkey’s efforts to prevent them crossing by land to Greece and Bulgaria. What did European countries say? Mr Rutte said Mr Erdogan’s comment that the Dutch were “Nazi remnants” was “unacceptable”, and demanded an apology. Responding to Turkish calls for sanctions, he said the Netherlands would “never negotiate under threat”. In a news conference on Monday, Mrs Merkel said she had condemned Nazi analogies made by Mr Erdogan about Germany the previous week. “This rejection is also valid for our allies. These comparisons are completely misguided… particularly in the Netherlands that endured so much agony through the National Socialists,” she said.